With the Clean Water Act changing the standards for drinking water Indianola along with most towns along the Republican river were forced to look for a new source of water. The City had moved their wells closer and closer to the river over the years as Nitrates first were the problem. Now being as close as they are, they fell under the rule “Under The Influence Of The River”. Also the standards of Uranium and Arsenic levels were lowered to where the two wells the city had could not meet those standards either. So along with Bartley and Cambridge, as they were in the same situation, a new water source was looked into. On April 27, 2005 the three cities were awarded grants and loans of over $6,000,000.00 from the USDA to develop a regional water system 10 miles North of Barley. From there 3 wells provide water that is piped to all 3 towns. October of 2008 the project was finished and water began to flow into the towns. It is called B.I.C. 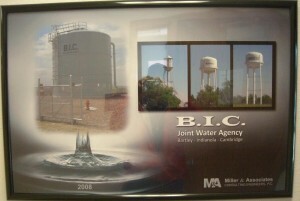 Joint Water Agency.